100% natural pure red henna hair dye. Harvest Moon pure natural red henna hair dye is red orange color on gray hair. Pure henna is an excellent conditioner and works on any hair. The darker your hair the less you will see any red orange, creating auburn on browns. Natural red orange pure henna will make browns auburn. The lighter the hair the brighter the red orange. For sunset orange (atomic) you can mix in a small amount of your favorite oil and leave on for 2 hours instead of 1. Harvest Moon Pure henna is used for henna tattoos by many tattoo artist around the globe. Ingredients – 100% Pure Henna. If you want an auburn effect and you have all white hair, you might want to consider our copper brown (copper top) with a small amount of indigo mixed in. The more indigo you add the darker it will get. On dark brown hair or lighter brown you can create auburn effects. Use over light, white or gray strands to get natural red highlights. If you are all white, or you want a “light” red effect, You can take a empty shampoo bottle and add 1/4 pack of powder and fill to the top with water. Shake well and then add to hair in the shower and rinse immediately. You can even mix it in with your shampoo in a baggy or in a bottle. Shampoo your hair and leave in for 5 minutes and rinse. This is why red heads have more fun! They spend less time doing their hair! Natural red heads do not have to do root touch ups, simple use in shower when needed! Just be careful with the hands and feet! Standing in henna or leaving it on your hands will stain you for a week. 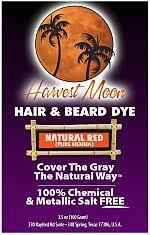 Harvest Moon premium red henna hair dye comes from a plant grown in India using private family owned crops. It is harvested 1 time a year and produces the highest quality henna in India. We take our hair dye serious and have grown every year because of word of mouth. Our customer service is second to none, we answer questions on the weekends and after hours. Consumer education is very important to us, especially with all of the false information on the internet. We care and love helping people. Rest assured our products are chemical free. Leave on 10 minutes, as a result the red is toned down. If you have used chemicals you need not worry. For instance, you can literally chemical hair dye and then immediately use Harvest Moon over the chemicals. Your hair will be instantly soft after your first shampoo. Harvest Moon has natural conditioners that condition your hair while it is adding color. Please remember colors might come out lighter on chemically dyed blond hair. We always recommend a strand test to see what color to expect. 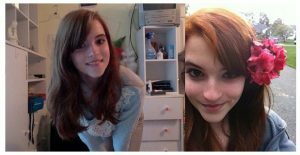 After using red henna hair dye ( and any other Harvest Moon colors, you will notice your hair will start to grow faster. This is perfectly normal and a healthy sign your hair is doing better. Harvest Moon will also protect your hair from the sun’s harmful UV rays. Above all and most importantly to looking fabulous, the more you use pure henna, the healthier your hair will be. You can use it as often as you like. If you have questions, please contact us. We do answer quickly, even on most weekends. Indications: You want to go natural or have had an adverse reaction to chemical hair or beard dye. Hair loss or hair damage from chemical hair dye or other related stress. Basic Instructions: Wash hair twice, mix powder and apply to hair evenly, covering all hair to color. All packets come with detailed instructions. Mix with any other color to create darker, different shades of colors.